The Opening of the seventh edition of Classical:NEXT at de Doelen concert hall in Rotterdam started with a real run on the counters. 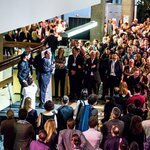 It is the best-attended edition so far, making it the biggest international gathering of art music professionals to date. The worldwide art music community - the delegates coming from 40 countries - was quick to phase into festival mode with the opening's theme of ‘What The France? !’, which saw performances from renowned French artists Van Kuijk Quartet, the vocal ensemble Les Voix Animées, flutist Juliette Hurel and pianist Alexandre Tharaud. 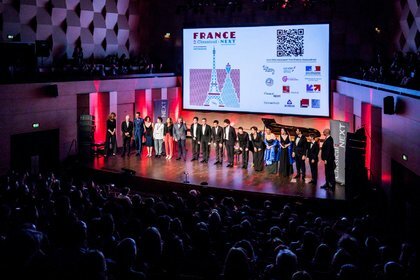 This year's opening event was hosted by an extraordinary alliance under the direction of Le Bureau Export in partnership with SACEM Caisse des Dépôts et Consignation, France Musique, the French Embassy of the Netherlands and Business France. The ‘What The France? 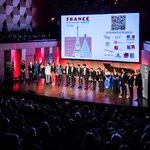 !’ programming was carefully crafted with live music performances, films on both the French music history and the new innovations in the music scene along with speeches of the performing artists, composers, and partners. "There is a French creative nucleus ranging from our very particular history all the way to the French Touch of the likes of Daft Punk and Air." The French focus will continue throughout the conference as well as with Friday Evenings contemporary music 'off C:N Showcases'. 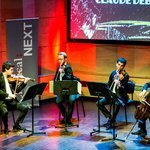 Both the professional conference and the international showcase festival programme for Classical:NEXT under the title of the ‘Seriously – Adventures in Music’ festival begins today and continues until Saturday, 19 May. Open to the public as well as Classical:NEXT delegates, a selection of 17 jury selected artists from around the globe, from Australia to Colombia and Russia, will grace the Classical:NEXT stages in a range of unorthodox formats.